We all remember mom‘s rules about running in the house, muddy feet and inside voices from our childhood. Now that we are grown and have our own abodes to enjoy, it is also good to remember those classic rules about proper etiquette and safety in the kitchen. 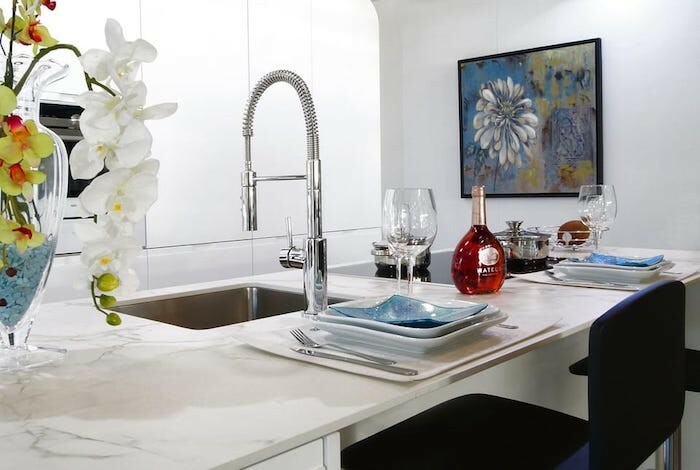 Let’s sayhttps://marble.com/granite-countertops/santa-cecilia/118 you have gorgeous quartzite countertops installed in your home and you could not be happier with the resulting sophistication they have brought your cooking space. Are you going to leave a spill on that lovely natural stone? Some stone colors do not show spills and scratches as readily and some don’t absorb liquid at all. But, a spill left on those magnificent quartzite countertops can leave them in bad shape before too long. Another ageless taboo regarding kitchen countertops is both a safety as well as a vanity concern: walking or standing on them. It is obvious to see why this would not be a good idea for anyone who would like to live to see longevity, but you may not realize that it can also wreak havoc on your granite countertops—or any other kind of natural stone countertops you may have. Though any countertop you purchase in the natural stone industry is going to be sturdier and more durable than those of the manmade variety you could buy, something as stunning as Santa Cecilia granite is not going to benefit from the sustained pressure of your weight or the prolonged submission to the dirt and oils associated with either shoed or bare feet. Fantasy Brown quartzite, a popular quartzite, is famed for its smoky veins of neutral coloring against pale backgrounds. This stone, most another quartzite, and nearly all granite colors are porous and subject to absorption of stains, etching or even cracking under the right conditions. Your natural stone kitchen countertops need care and maintenance, such as protective sealing a couple of times per year. Daily pressure and unnecessary exposure to dirt and grime could eventually mar the stone over time. Think of your kitchen countertops as functional works of art, not thoroughfares to the top cabinet. 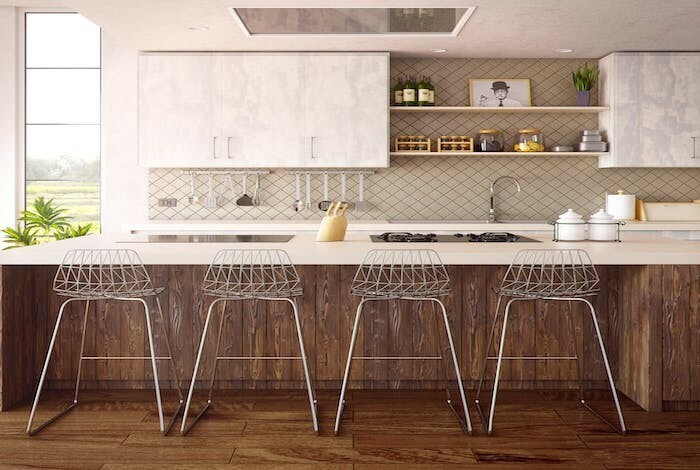 Though one of the most attractive features of kitchen design materials from the natural stone industry is their inordinate durability, there are few some natural stone countertops that can still be scratched by exposure to knife blades. Soapstone, for example, will scratch easily so we would not recommend that to be installed in a heavy-traffic area like the kitchen. But when it comes to granite, for example, those Bianco Antico granite countertops that you have been coveting for decades, you definitely do NOT want to cut directly on its surface. Granite is so hard that it will dull your knives. Always use a cutting board for the sake of your knives and leave cutting granite to professionals. who prepare it to go home with you. Talking on the phone while cooking is the texting while driving the kitchen. Think about it: you have got four pots on the stove, a pan of brownies in the oven and your best co-worker, Clara, on the other end of the line telling you the latest in prime office gossip. Your attention is split and focused on anything but your timers. In these scenarios, a multitude of kitchen tragedies can occur very quickly. An electronic device around water is, of course, never a good idea, but you are also in imminent danger of burning yourself, destroying your meal, setting an unintentional fire or overflowing staining fluids onto your quartzite countertops. It even becomes much more likely that you accidentally run into an open cabinet door, painfully bump against a sharp countertop edge or even cut yourself with an errant knife blade. Just like driving, cooking requires your full attention and all five senses to be engaged. Trade your temporary focus on Clara for careful awareness of your Santa Cecilia granite countertops—trust us, granite’s timeless worth will outlast Clara’s gossip even on its juiciest day. While the kitchen is a marvelous traditional gathering place for the family and a wonderful venue for engaging communal time with your loved ones, it is not an appropriate place for arguments, hot tempers or disagreements. If you know that an important but difficult conversation must be had between you and your partner or child, find someplace other than the kitchen to conduct this discussion for several reasons. You want the overall vibe of your kitchen to always be welcoming. You go to great effort picking out stone colors for your kitchen countertops and matching cushions to appliances, etc. because you want your kitchen to be inviting. Why then would you purposefully associate this positive place with negative or difficult memories? It is a fact that families disagree, argue and maybe even escalate tempers to the level of shouting or pacing. No matter the difficulty you are facing, you do not want its journey or its outcome to affect the cozy quality you have worked hard to instill in your kitchen. Find another room in your house for these kinds of conversations and let your granite countertops be the only hard thing that has a place in your kitchen. There are some things you want to avoid in the kitchen especially when you have just finished a kitchen remodel. Just a few ideas that will surely keep your kitchen the “heart of the home”, your favorite gathering spot, a safe place, a place of comfort, the spot to share a drink with those you care about, and the area to enjoy meals with your loved ones.